Before birth, the fetal circulatory system includes three open structures through which blood moves and normally close soon after birth. These structures are the ductus arteriosus, the ductus venosus, and the foramen ovale. The foramen ovale allows the shunting of oxygen rich blood from the placenta from the ductus venous into the left atrium. This allows the blood with the most oxygen to reach the brain. In the fetus, oxygenated blood (red in the illustrations) enters the circulatory system through placental transfer. The umbilical vein brings oxygenated blood through the ductus venosus to the inferior vena cava and right atrium, where it is directed by the Eustachion valve across the patent foramen ovale and into the left atrium. 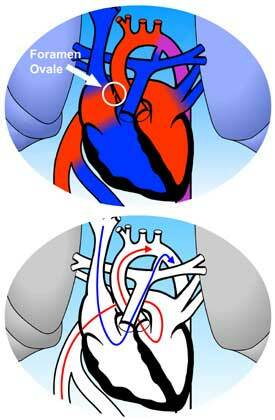 This allows the left ventricle to pump the most oxygenated blood to the coronary (heart) and carotid arteries (brain). Deoxygenated blood (blue in the illustrations) returning via the superior vena cava is preferentially directed across the tricuspid valve and into the right ventricle. The right ventricle pumps this blood into the pulmonary arteries, and across the patent ductus arteriosus into the descending aorta.